When America was a young country, George Washington commissioned our first Navy ship to be built in Charleston, SC. Unlike most ships of the day, the builders used live oak from the Carolinas making it almost impenetrable. After Paul Revere added the copper inlays to the front of the ship, the Constitution sailed off as America’s only navy vessel. In its first battle, the first shot fired was a British cannon shell. It hit the Constitution and bounced off, leading the British to think it had iron laid behind the wood walls of the ship. American sailors soon nicknamed the Constitution “Old Ironsides.” In this particular engagement, the first US Marines raked the decks of the attacking ship, keeping the British officers distracted, while the Constitutions guns pounded its rear and center masts to make it immobile. A young navy lieutenant designed extra sails to help the constitution maneuver faster and better than the British ships. Most of the enemies shells simply bounced off its sides, and it continued to evade the British navy for the rest of the war. 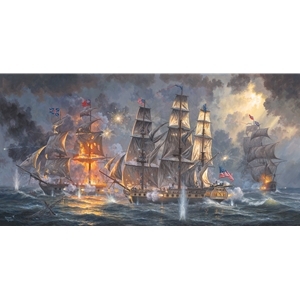 In this painting, we can see the British abandoning the burning HMS Guerriere, as the Constitution pulls in for another broadside. The marines are climbing for better shooting positions, and the doctor is desperately working in the captain's cabin to bandage the sailors wounded in battle. I can’t imagine the fury these men endured during this battle, but it had to have been comforting to be in such a strong ship. This ship embodies the “Strength” of the people of America who have fought so hard and given so much. But I think it has a deeper inspiration for us now. That no matter what odds we may face, we can have the courage and “Strength” to sail outnumbered into battle and emerge victorious, no matter how long the odds.